The Strokes are to release a new album in 2013. The Stroke’s fifth album will be released later this year and will most likely include their single “All the Time”. 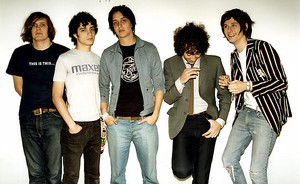 News about their new album were received hours after a US radio station claimed it had been sent a brand new Strokes song that was called “All the Time”. The new track was said to have been sent by RCA records. Phoenix have named their upcoming album Bankrupt! On the band’s website (http://www.wearephoenix.com/), the homepage has a sound clip, thought to be taken from the new album. Phoenix will play Rock am Ring im Park festival in Germany. The performances will take place from July 7th -9th. Other performances in the festival include Green Day, The Killers, and The Prodigy. It has been said that Phoenix are set to release their new album in April after Daniel Glass (head of Phoenix’s record label, Glassnote Records) mentioned the release date. Yeah Yeah Yeahs had performed a few brand new songs at a show at the Glass House in Pomona, California on January 11th. The band opened up the show with one of these brand new songs and followed it with “Phenomena” and then another new song. All of the new songs that were performed are thought to be taken from their upcoming fourth LP. To check out the complete list of songs performed by Yeah Yeah Yeahs at this show, be sure to visit: http://www.nme.com/news/yeah-yeah-yeahs/68142. Black Sabbath have announced that their new album will be called 13 and it is set to be released in June. Black Sabbath have made the album primarily in Los Angeles and it features Rage Against the Machine’s Brad Wilk on drums. They have also revealed that the album will include 15 tracks. Black Sabbath will tour Australia, New Zealand, and play a show at Ozzfest in Japan. To see a list of tour dates, go to: http://www.nme.com/news/black-sabbath/68143. Palma Violets have announced details of a UK tour that is set to take place in March of 2013. Palma Violets will be touring in support of their debut album 180, which is set for a release date in February. This short tour will begin at the Lemon Grove venue and other tour dates will be in Cambridge, Sheffield, Middlesbrough and Oxford. Palma Violet’s debut album is set for a release date on February 25, through Rough Trade Records. This debut album includes their single “Best of Friends”. For a complete list of tour dates, be sure to check out: http://www.nme.com/news/palma-violets/68242. Zedd has recently done an acoustic performance of his song “Clarity” alongside Foxes and Alvin Risk on the David Letterman Show. Zedd had also released an official music video for his song “Clarity”, which also features Foxes in it. To watch the music video, be sure to visit: http://www.dancingastronaut.com/2013/01/zedd-releases-official-music-video-for-clarity-2/. The second annual benefit concert for the Children’s Orthopedic Center in West Hollywood will be headlined by Deadmau5. Last year, this event raised over $150,000 and there is hope that the same will happen in 2013. Deadmau5 is headlining alongside Crookers and Nero, yet there are still more artists to be announced. Tickets for this event are $264. To buy tickets and check for ticket availability, be sure to visit: http://concerts.livenation.com/event/09004997D3864861?dma_id=324. Katy Perry and Alicia Keys are among a diverse group of musicians lined up for the Inaugural Ball this Monday, as President Obama is officially sworn in for his second term. For the official Inaugural Ball, Keys and Perry will be alongside other artists such as fun., members of the “Glee” cast, John Legend, Stevie Wonder, Usher, Far East Movement, Soundgarden, Brad Paisley, and more. The Commander-in-Chief’s Ball, which honors America’s armed forces, will have artisits such as Alicia Keys, Brad Paisley, Jamie Foxx, Jennifer Hudson, and Marc Anthony. Both of these events will take place on January 21st, after Obama has taken the oath of office. Luke Bryan has just landed the job of the Academy of Country Music Awards’ co-host. Luke Bryan has also sold out his 21-city Dirt Road Diaries Tour. It has been said that Luke Bryan has added additional tour dates, being that his first-ever headliner tour has already sold out. 35 more shows have been added. The locations for these tour dates include Boston, Philadelphia, Washington D. C., Chicago, San Diego, and more. To see a complete list of tour dates, be sure to visit: http://www.countryweekly.com/news/luke-bryan-sells-out-tour-announces-second-leg. This entry was tagged Alicia Keys, Black Sabbath, Brad Paisley, Deadmau5, Fun., Katy Perry, Luke Bryan, Palma Violets, Phoenix, Soundgarden, Stevie Wonder, The Strokes, Yeah Yeah Yeahs, Zedd. Bookmark the permalink.